It has been a real privilege to welcome Hans Von Sponeck to our campus. Hans worked for the United Nations for more than thirty years and in 1998 was appointed UN Assistant Secretary General. During his service, he worked for the UN Development programme in Ghana, Turkey, Botswana, Pakistan and India. Since his resignation from the UN he has served as a member of the board of UWC Adriatic and UWC Mostar and has both headed up the UWC Iraq Focal Group and been responsible for selecting Iraqi students to attend UWC schools and colleges. Hans helped to select Mohammed (currently a first year at RCN after a Foundation Year) for our Survivors of Conflict Programme and is here on campus this weekend to visit Mohammed. We also chose this weekend for the visit as it is the designated weekend in our annual calendar for RCN’s Model United Nations. Hans was invited by Blessing (Secretary General of RCN’s MUN – Zimbabwe) to give the opening address to the General Assembly and formally to announce the MUN open for 2016. 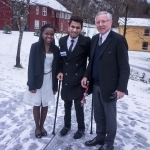 Hans also attended different committee sessions as well as shadowing Mohammed to the DISEC Committee. 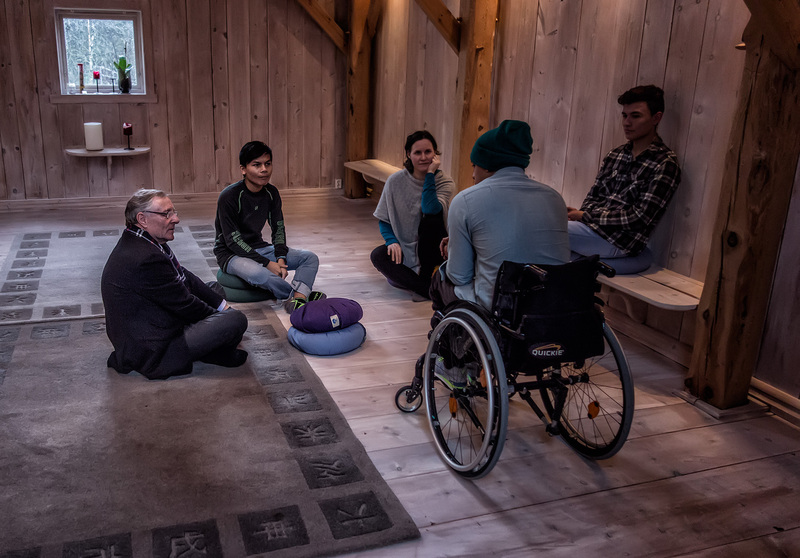 During his visit, Hans took the time to meet the members of staff at RCN and RKHR who contribute to the Survivors of Conflict Programme and, at another point in his itinerary, to talk with the other student participants in this programme in the Silent House. We look forward to welcoming him back to RCN sometime soon. Today is Holocaust Memorial Day (27th January). 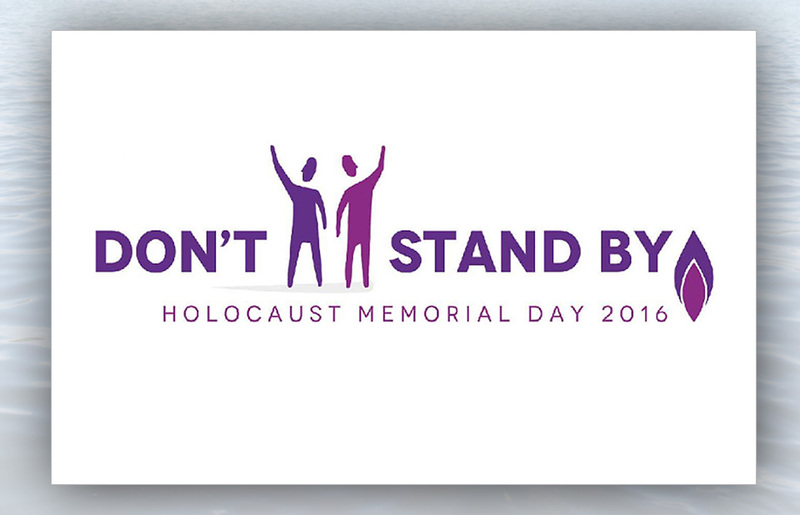 ‘Don’t stand by’ is the theme for Holocaust Memorial Day 2016. For more information on Holocaust Memorial Day, please click here. My two years at UWCRCN has deeply affected the way I am and what I do today. Going to a university was not the obvious choice for me when I grew up as a refugee from Iran in a socially disadvantaged neighborhood. But after UWCRCN I chose to study Social Sciences, driven by a curiosity to better understand the world around me. Since then I have been working project-based for a range of private and public organizations and have always tried to spice up the projects with some UWC idealism. An example was in 2011-2012 when I was part of the team planning and organizing the Danish Presidency of the European Council. My team decided to add sustainability as the framework of the Presidency. This meant considering environmental, social and economic aspects of all decisions from choosing suppliers, the way we cooperated with other actors as well as in our communications. The Presidency ended up being nicknamed “The Tap Water Presidency” and was the first event to be certified as a sustainable event. But more importantly, the UWC experience has made a huge difference for me on a personal level. 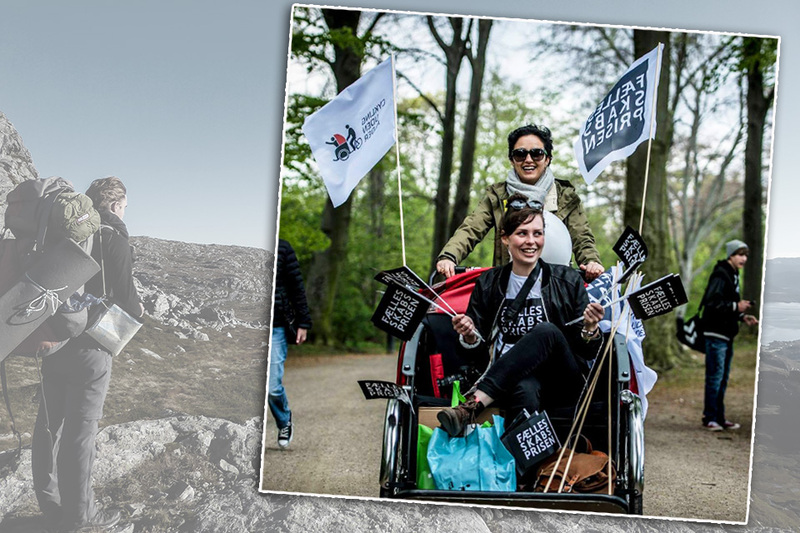 Being selected to represent Denmark at a UWC as a Danish student was a recognition of me as a new kind of Dane. It gave me the feeling of inclusion in society that no integration policy will ever be able to achieve. After finishing the intensive term from August to December, winter break is a reward for many students. Some can now eat the food they wanted to any time. Some can go back to meet their ‘long time no see’ family, relatives and friends. It is a complete break to leave all demands of school behind. 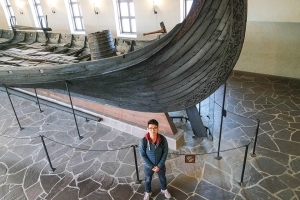 Our story is of a group of 23 first years and 2 second years who stayed back in Norway during the winter break. The college had set up a special programme for those of us who couldn’t go home. 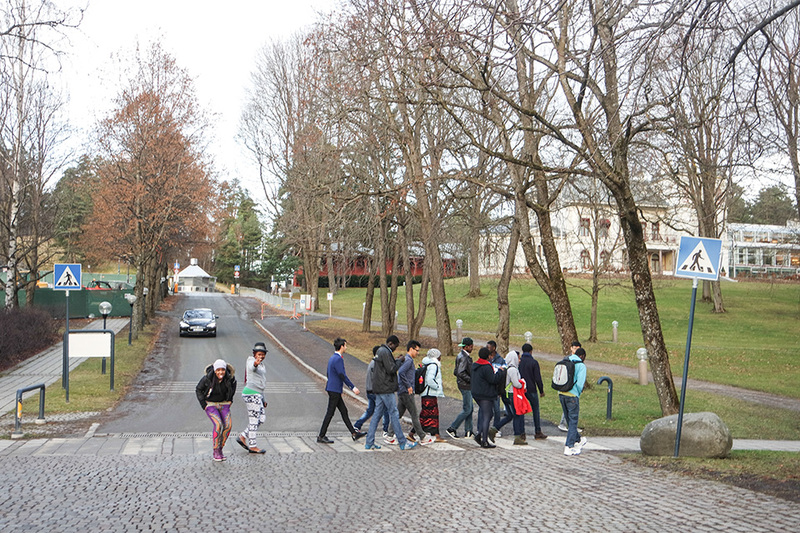 Led by Narender and Ika, on the evening of December 9th, we took an over night bus to Oslo. 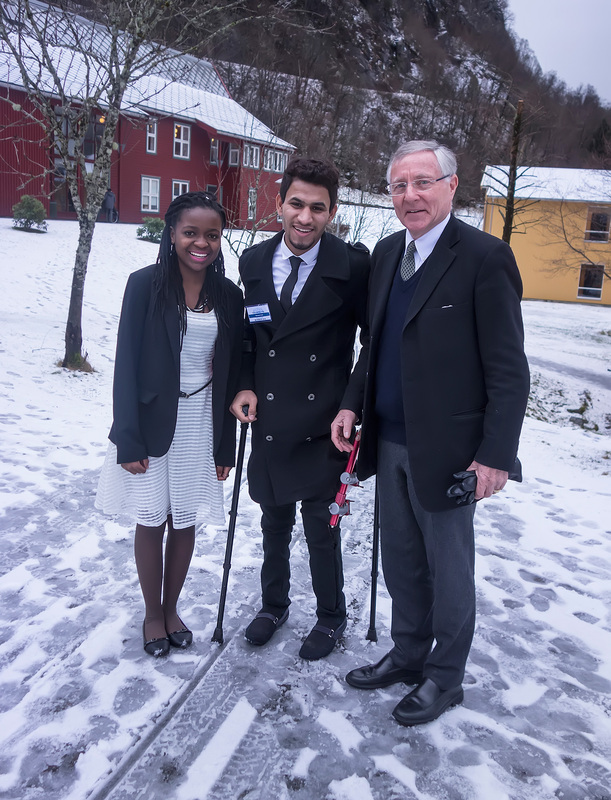 Our first destination was the company DNVGL where we had participated in a conference on leadership with other students from all over Norway, through an organization called Young Ambassadors. Many of us took active part in the discussion and learned leadership skills. In the evening we were all picked up by our new host families. The next day we went to Hovseter Secondary School, where we shared experiences and made Christmas decorations with their students. In the afternoon, we went to the head office of the Norwegian Red Cross and SOS. The presentations from staff and volunteers were excellent. On the last day we went to the Viking Ship and Kon Tiki museums. 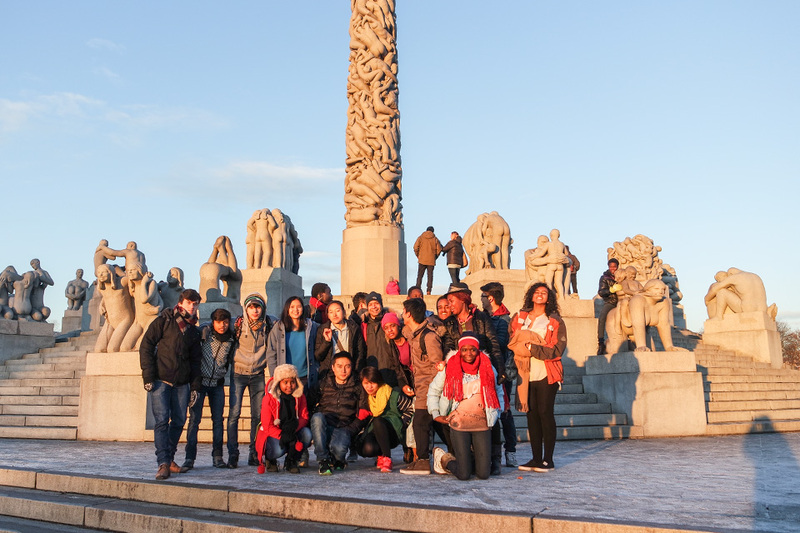 We also decided to explore the famous Vigeland Park. It was a cultural shock for many to see so many naked sculptures, but still everyone ended up taking pictures with these statues! Fun in the snow for everyone! 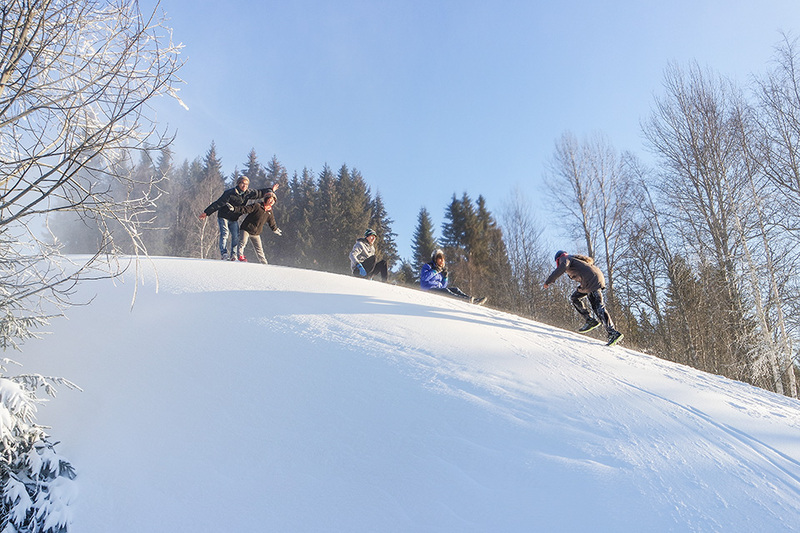 With its glorious Winter Olympic history, on December 13th Lillehammer welcomed us by covering itself with white snow. 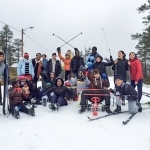 Some of the students could play in snow for the first time in their lives. We were also welcomed by three enthusiastic host students from the Nansen School, where we spent the next two days. We got the chance to listen to three extraordinary presentations on the Nansen Peace and Dialogue centre by a previous Rektor Inge Eidsvåg, and Bente Knagenhjelm. 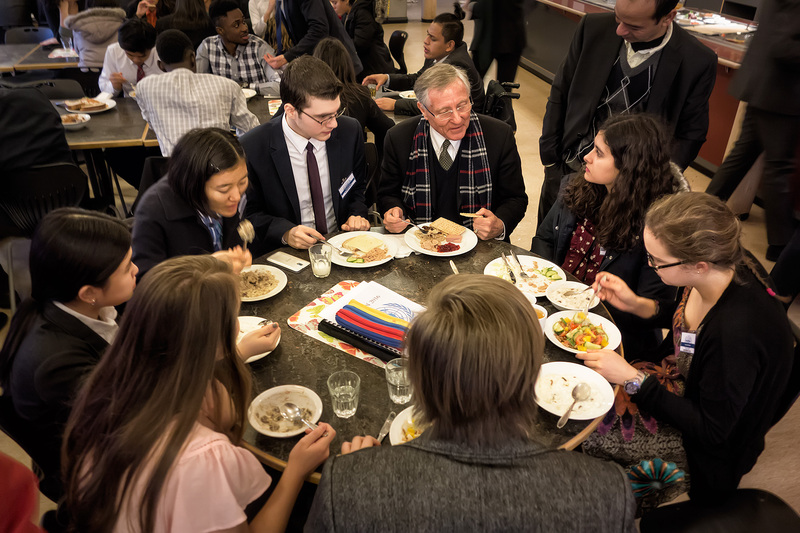 It was astonishing to hear about the efforts they have put into peace making through dialogue. Some of us managed to make close friends with the students there. On arrival back to our campus after a long bus journey, we were hungry but had not been forgotten. Arne Ophaug was waiting us in the Høegh Centre with warm food. Everyone was happy because they felt at home. For the next few days we had a light schedule. We were all invited to Larry’s house for an advance Christmas dinner and thanks to Larry, Edmund and Hildegunn the dinner was splendid. Our Secret Santas revealed themselves and we all received a gift. The cost of the gifts was sponsored by another friend of our college. After a few lazy days, we set off again for another adventure. From 20th until 23rd of December, we stayed in the cozy Red Cross cabin at Langeland near Førde. We originally went there to ski but there was hardly any snow. So, we went on a hike in the rain instead! On the second day we tried a few hours of skiing on a patch of snow left behind at the ski stadium. 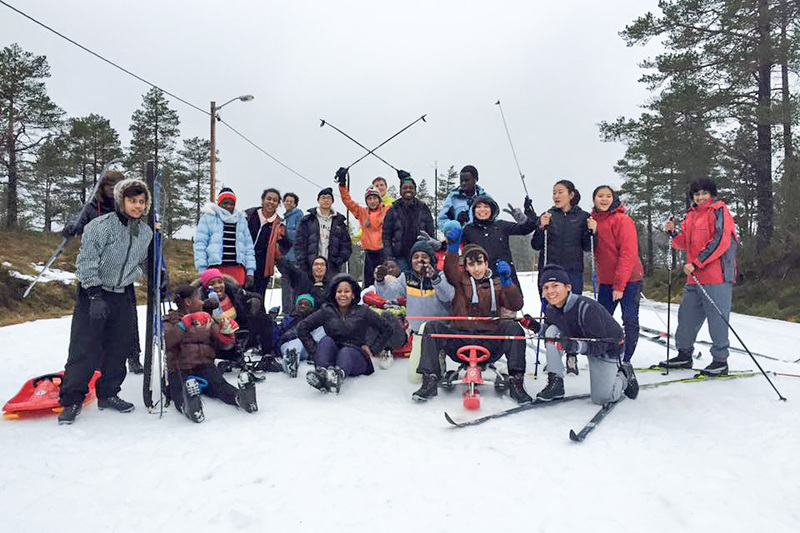 Many picked up basic skiing skills and had lots of fun falling and sliding on the snow. Peter, the RCN chef, stayed with us and cooked lots of nice food to help us enjoy cabin life. For the last part of our programme back on campus, we didn’t have a fixed schedule. Some of us went biking, hiking, walking, playing table tennis and playing a computer FIFA tournament. Due to Hildegunn’s efforts we all got host family during this period. People say that when the time is good, it flies. We all felt the same when we realized it was the end of the winter program. Many of us think it was the best part of our UWC experience. 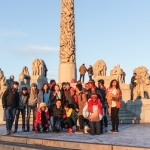 We are all deeply grateful to Naren, Larry, both Arnes – Ophaug and Osland, Kjetil, Hildegunn, Barbara, Ika, Peter and many more for making this program so successful. Thank you all! !